You are currently browsing the tag archive for the ‘massachusetts’ tag. Preview Massachusetts: An interview with Lynne! Our friend, Sarah Buttenwieser, recently interviewed Lynne for the latest issue of Preview Massachusetts Magazine. You can read the interview here! Sakura Bloom Tomorrow at A Child’s Garden! Tomorrow is the day! Please join us at A Child’s Garden for a Sakura Bloom trunk show and demonstration. 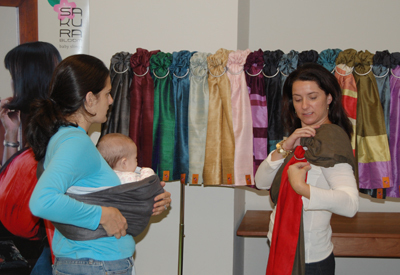 Come see all of our gorgeous Sakura Bloom slings, including the new Luxe Collection, and receive one-on-one consultations from Sakura Bloom founder and designer Lynne Banach. Saturday, November 3 from 12-4 at A Child’s Garden on Main Street in Northampton, Massachusetts. Come on by, say hi, and perhaps win a sling! Everyone who purchases a sling at the show will be entered into a drawing to win a free linen or silk Essential Sakura Bloom sling. It could be you!